Latin America dumped as organisers opt to move to 'uncharted terrain' of Saudi Arabia. 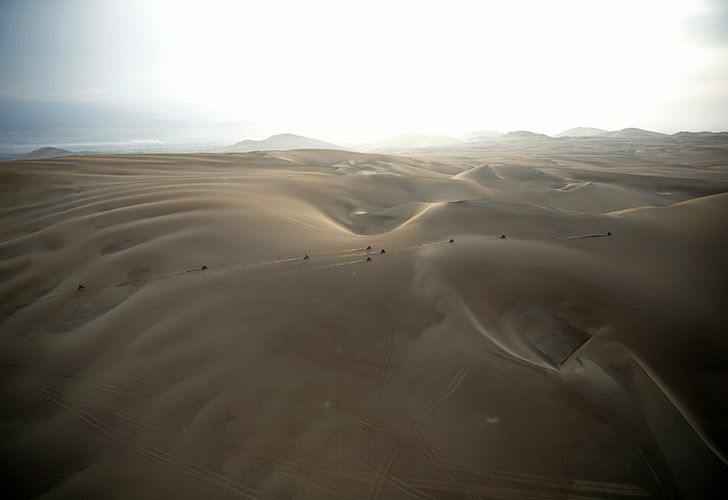 The Dakar Rally is dumping South America – for Saudi Arabia. Dakar Rally organisers announced today that next year's race will be held in "the deep and mysterious deserts of the Middle East, in Saudi Arabia." The move will offer contestants an "unknown landscape and uncharted terrain," they added. "After 30 years of discovering the beauty of Africa and a decade of adventure exploring the spectacular landscape of South America, a new chapter in the history of Dakar will be written as the world's biggest rally makes its Middle East debut in Saudi Arabia," ASO said in a statement. Created by Thierry Sabine after he got lost in the Libyan desert in 1977, the Dakar Rally was raced across Africa until terror threats in Mauritania led organisers to cancel the 2008 edition. The rally has then been held in South America ever since, with legs in Argentina, Chile, Peru, Bolivia and Paraguay. Details of the 2020 race will be announced later this week in Saudi Arabia. Dakar Rally director David Castera says "it's a grandiose challenge, with this blank page, with unlimited possibilities." The five-year deal will be "a voyage into the unknown," he added. "By going to Saudi Arabia, it is of course that aspect that fascinates me," Castera said. "I'm convinced that such a feeling will be shared by all the riders, drivers and copilots. As the director of the event, it's a massive challenge to be faced with a blank page with limitless possibilities." Castera said Saudi Arabia offered up "a monumental geography, made for the most audacious itineraries." "We are spoilt for choice. Sports, navigation, a will to surpass oneself: all these aspects will naturally be glorified on this territory made for rally-raids." Saudi Prince Abdulaziz bin Turki al-Faisal al-Saud, chairman of the Islamic kingdom's General Sports Authority, said hosting the Dakar was part of Riyadh's wider economic and social plan. "The vision and guidance of our leaders have made our dreams and ambitions limitless and have set the sports scene in the kingdom on a remarkable success route," he said. "Today we are thrilled to announce that Rally Dakar, an event with a huge global appeal is coming to the Kingdom of Saudi Arabia and the Middle East for the first time. Our country is extremely passionate about sport and our strategic goal is to feed that appetite as we move further towards achieving Vision 2030, of which sport is a basic pillar." Vision 2030 is a blueprint drawn up by Crown Prince Mohammed bin Salman bin Abdulaziz aimed at creating a "strong, thriving and stable Saudi Arabia that provides opportunity for all" by diversifying the economy to help ride challenges thrown up by changeable global energy prices and also by implementing social and lifestyle changes. On the sporting front, Saudi authorities have already been busy trying to make it into an international hub, much as their regional rivals the United Arab Emirates and Qatar have. Saudi Arabia have recently hosted the WWE Crown Jewel, a Formula-E race on the streets of Riyadh and January's Italian Super Cup between AC Milan and Juventus, while an exhibition match between Novak Djokovic and Rafael Nadal in December was called off because the latter was injured. George Groves and Callum Smith battled it out for the WBA super-middleweight and World Boxing Super Series (WBSS) titles in Jeddah, while American Dustin Johnson won the European Tour's inaugural Saudi International in February. "In hosting the Dakar Rally we aim to produce an unbelievable and unforgettable experience for drivers as they discover the beauty of Saudi nature and a unique spectacle for motorsport fans not only in Saudi Arabia but also in the region and around the world," said Saudi sports supremo Prince Abdulaziz. 2Saskia Sassen: "Many of the spaces we believe to be public are privately owned"